He is one of the main characters of what was the last golden age of the Argentine first division. Born in the lower ranks of Gimnasia y Esgrima de La Plata, Guillermo Barros Schelotto became a legend when he joined Boca Juniors in 1997. For over a decade, the unforgettable number seven was part of a team that won half a dozen league titles, two editions of the Copa Sudamericana, four Copa Libertadores and two Intercontinental Cups. Barros Schelotto has the rare privilege of being idolized by fans of the two teams he played for in Argentina. He certainly is one of the greatest players (along with Juan Román Riquelme, Martín Palermo, and Colombian footballers such as ‘Chicho’ Serna and Jorge Bermúdez) in the Boca squad that made history, both at continental and global levels. Over sixty goals and countless assists are Guillermo’s most tangible legacy for the Blue & Gold shirt. The 2005 and 2006 seasons were the two of the most productive in Boca’s recent history. In just twenty-four months the team won five titles, both in Argentina and South America. But Barros Schelotto had no significant involvement in obtaining those achivements. About the same time Major League Soccer got in his way, as the former player told Jugador Franquicia in an exclusive interview. (Alfio) Basile was Boca’s coach back then, and I was not playing much as a starter. I traveled to San Juan de Puerto Rico to visit my brother (Gustavo Barros Schelotto), because he was playing for the Islanders in the USL. There I met Jorge Alvial, which at that time was the head coach of the team, and had previously been an assistant coach at several franchises in the MLS. Now he works as a scout for Chelsea in South America. So we started talking about soccer. Alvial asked me if I was willing to play in Major League Soccer. I replied that I liked the idea, because I was already a veteran in football and the United States seemed like an interesting place to live. He told me he knew Mark McCullers, Columbus Crew’s manager. That was in 2006, and in 2007 they came to Argentina so see me play and talk to me. Two weeks after that they made me an offer to go to the MLS. What did you know about Columbus and the league at that time? I did some research on the internet about the city, but I also had close relatives who had lived in the United States. I figured it would be something interesting and that moving would be a safe thing for the whole family. And I realized it was a league that was growing progressively. The Galaxy had hired (David) Beckham, Chicago hired Cuauhtémoc Blanco. They were getting some big names that made it even more interesting. What did you find when you arrived at Columbus Crew? The truth is that I found an organization with a solid base. Because they had their stadium, training facilities, offices. It was comparable in structure to Boca, no doubt. I found it all very organized, very American if you will. Everything in its place. One experiences a huge pressure in Argentine football. Negative pressure, not the positive kind of pressure. That does not exist in the United States, which allows you to live in a calm environment. One could sense that. When I was introduced to the fans in Columbus the coach and my teammates joined me. It was a normal ceremony, nothing unusual. I felt very comfortable right from the start. Are you still in touch with the club? Yes, I still am in contact with some people in the club. I keep in touch with some former teammates. I always travel to Columbus every six months. Recently I ran into Frankie Hejduk, who is working in Columbus. I saw him in a shopping mall and we chatted for a while. We are always in touch. The truth is that my family and I had so much fun there that we sincerely feel very attached to Columbus. We are in contact with many people from the city, people from the club or from the neighborhood where we lived. I loved the experience of playing there. So you are up to date with what the Crew are doing in the league. Yes. I keep myself informed about the MLS, which improves over time, and its growth. I also follow the news about former teammates that now play for other teams. I try to find out how they did every weekend. And besides that, I really like the league. Every weekend I look for the final scores, the news about different teams, and anything related to the league. Unfortunately in Argentina you can’t use MLS Live. That’s a pitty because I can not watch the live games that I want. But I follow the league through the MLS website, where I find the highlights of the games and other information. It shows that the league’s economy is growing and that the teams are growing as well. From a distance one senses that the process of selection is now more strict and that they expect to hire coaches with better records than in previous seasons. Sigi Schmid was your coach in Columbus. What kind of coach is Schmid? I my opinion, he is very good. I do not keep daily contact with him, but every three or four months we talk over the phone or we send each other emails. We talk about players and other things. Schmid was very kind to me. I liked his way of training, which is simple. He plays to win. You may defend or attack, but he is very straightforward. His style is very straightforward. I always watch the Seattle games, of course. I know they have won the West Conference two or three times, but have failed to reach the MLS Cup game. I like Schmid. He is a very German coach. The Major League Soccer today is a coveted destination for many South American players. The financial problems that some teams and leagues in Europe experienced in recent years have enhanced the attractiveness of North American professional soccer. This situation has not gone unnoticed for Barros Schelotto. Many players in Argentina look forward to the possibility of going to the MLS. It is a real possibility. They want to go there, even at a young age. In addition, the MLS has become a repository for the Argentine ‘enganche’ (the attacking midfielder, the ‘trequartista’ in Italian soccer). A position regarded by many as an endangered species in international football, but that seems to be in good health north of the Mexican border. The most recent examples are those of Diego Valeri, Ignacio Piatti and Matías Pérez García, who excelled in that position in the Argentine league. Soccer is dynamic. Tactics change slightly over time. So the creative player has to change his position in the field. Sometimes they play in the typical ‘enganche’ position, as (Juan Román) Riquelme and Javier Morales do. I had to play in that position in Columbus Crew. I was an attacker, playing behind the center forward. I understand that (Federico) Higuaín is playing in that position now as well. These players end up being important in any scheme. I think that with the growth of the league and its franchises now they have the ability not only to get Argentine footballers on loan. Now they can hire them permanently, for several seasons. In the case of (Ignacio) Piatti what happened is that his contract with San Lorenzo had expired. They did sign Pérez García. They signed Valeri as well (at first it was a loan and later on they signed him). I think the MLS teams have a greater interest in Argentina. Not only they get just the players they can hire according to their budget, now they are starting to get the players they really want. The emergence of the MLS in the Argentine job market transformed Guillermo Barros Schelotto into an adviser for many players. I’ve talked to several of them. (Diego) Valeri was playing for us in Lanús when he went to Portland. He had already decided to go there because it was a very good deal for him and he was very interested. So I told him about my experience. I imagine that since the league has improved he must be enjoying it even more than I did. I also talked to Federico Higuaín when he went to Columbus. I met with him here in Buenos Aires. It wasn’t like they accepted the offers after I told them about my experience. They already had decided to join the MLS. I just gave my support. Because I knew where they were going to play. And it was very good. ‘The Twin’ was not the first Argentine player in Major League Soccer, but he was the first to catch the interest of the fans in the southern tip of the continent. They started to look at the first division of the United States and Canada with more respect. In his four seasons in the league he scored 37 goals and generated 57 assists over 110 games. 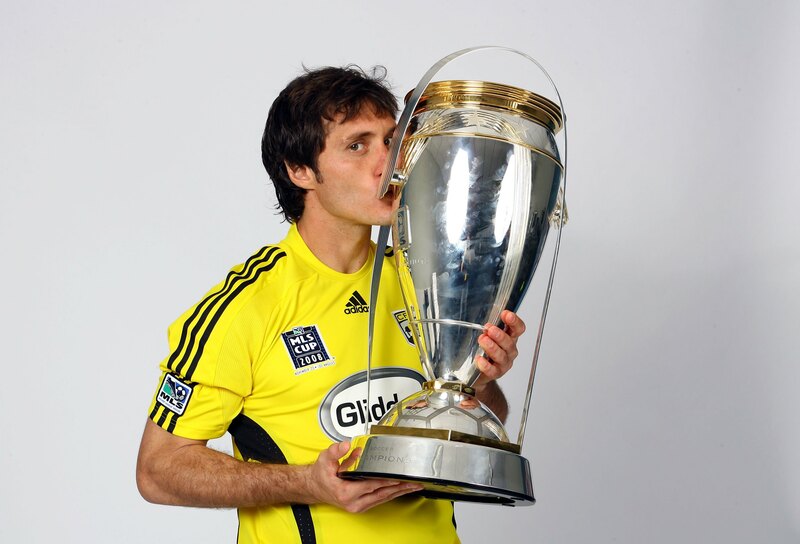 And, most importantly, he raised the MLS Cup in 2008, when Columbus Crew defeated New York Red Bulls by a 3-1 score. His team also won the Supporters Shield in 2008 and 2009. The impact of Barros Schelotto both in Columbus and the MLS is also very important. In the 2008 season he was the Most Valuable Player (MVP) of the league and the MLS Cup game. He was included in the MLS Best XI in 2007 and 2008. Amid so many honors and trophies Guillermo remembers the players who impressed him the most while he wore the Crew’s jersey. I love Sean Johnson, Chicago’s goalkeeper. I think he will end up playing in the Premier League, no doubt. Chicago Fire came close to signing Silvio Romero, who was our striker in Lanús. And I told him, “You’ll be able to score against every team, but you will not be able to score a goal against your team’s goalkeeper”. I think I played once against Johnson and I was amazed. I was struck by the way he played. I loved it. We are talking about American players, aren’t we? Because at that time (David) Beckham, or now (Robbie) Keane, and Javier Morales when he won the title with Salt Lake, they were all very good. I’m talking about the Americans because they were the ones I did not know. I liked (Brad) Davies, who played for Houston. Brad Evans and Robbie Rogers, they played with me in Columbus Crew. I think they are still young, because they were 18 or 19 when I was there, so they must now be 25 or 26 years-old. They were two remarkable players. I liked them a lot. Even (Chad) Marshall, who is now in Seattle, I think he is a great centre-back. He had many head injuries. I told Alejandro Moreno that Marshall was a player made for the Premier League. (Brian) McBride had returned to Chicago, and he was in the final stage of his career but you could tell he was very good, a natural scorer. And (Juan Pablo) Ángel was in New York that year. He did very well during his first two seasons there. Then you have a positive opinion about the American players in MLS. Yes, the American players have an edge over the rest: their physical strength. The American footballer is generally very strong. And you can’t say the same thing about all the foreign players in the MLS. I did not consider myself as a physically powerful player. And you could tell that all the Americans had that factor. All were strong and powerful. And they were fast too. What are the most rewarding memories and what is the most negative experience of your stint in the MLS? Negative, none. Those four years were very good for me. I can say that the best moment was when we won the MLS Cup in Los Angeles. That was achieving a great career goal. But I did not experience anything negative. The four years I spent there were good, because they treated me very well. How do you evaluate the possibility that in the future the best MLS teams are invited to compete in the Copa Libertadores? I think that it would be fine in terms of competitiveness, because that would put them one step closer to the big leagues of the continent, such as those of Argentina, Brazil, Mexico. Because the MLS sides have CONCACAF’s Champions League, but the only tough competitors there are the Mexican clubs. It would be great. It is very difficult to schedule midweek international games. Especially if you’re a team of Buenos Aires and you have to fly for eighteen hours to play against Seattle Sounders. But I think it would be great to find a way for MLS clubs to compete with teams from South America, because that will get them to grow a lot in the sports side. And that would extend the brand of the MLS, even though I think it is well installed. When will the MLS be acknowledged as a respected, well known league in the rest of the world? Many still consider it is some sort of a golden retirement for European football greats. I think they just need more time. The growth of the MLS was very strong in recent years. They have to keep on cementing and expanding. I think the MLS does the right thing by bringing not only famous players, but players who can make the league grow. I know that (Frank) Lampard will join the league soon. He is currently playing for a very important team, and perhaps he is in the last years of his career, but he still can give a lot to the MLS. There is not much to add to the league’s growth. Our web’s name is ‘Jugador Franquicia’ (‘Designated Player’, in Spanish). You were a designated player in Columbus. Could you explain in a simple way what ‘designated player’ is, please? Honestly, I never considered myself as a franchise player or a designated player, or that it was any different from the rest of my teammates. I remember one day one of the assistant coaches said something about me being a designated player, and when I finished training I asked him not to mention it again in front of my colleagues. It meant nothing to me to be a designated player. I was just another player, just like the rest. I always tried to help from my position. No matter if I was a franchise player or not. I realize that this is a recognition in the American sports culture. But to be honest this situation was not pleasant for me. I did not want anyone to treat me in a special way. Today Barros Schelotto is a young and renowned coach. Lanús won the 2013 Copa Sudamericana (a sort of equivalent of UEFA’s Europa League in CONMEBOL’s territory). His team is a permanent candidate to win the Argentine league. And his name always sounds whenever a crisis strikes Argentine soccer powerhouse Boca Juniors. Now we must add the possibility that Guillermo and his brother Gustavo may end up being hired by some South American national team eager to clinch the qualification to the 2018 World Cup. Despite this exciting list of job options GBS does not rule out or minimize the chances of being the coach of a Major League Soccer team soon. Not too long ago your name was mentioned as a possible coach for Columbus Crew. Did you get a solid offer from the club? Do you see the MLS as a still distant option in your coaching career? I received a phone call from the Columbus Crew general manager. They were interested in my situation in Lanús. Well, the team had a new owner. The previous owners were members of the Hunt family and I think (Anthony) Precourt had recently bought the club. I was under contract and could not get out of Lanús, obviously. They never offered me the coach position, (Mark) McCullers just wanted to know what my situation was. I really look forward to the possibility of training an MLS team and I hope I can work there someday. Today I have a contract with Lanús, but I do not rule out the Major League Soccer. As soon as I am available and a MLS club makes me an offer, I will be there. I am not going to speculate, or wait to be again in the MLS at the end of my coaching career. I think of the league as a possibility in the near future. Is Columbus Crew the only option for you in the MLS? Or are you willing to listen to offers from other teams? Obviously I have a great sense of appreciation and gratitude for Columbus, because they have treated me very well both in the club and the city. But overall the MLS clubs and the people working for them behave according to similar parameters. Any team would be a good option for me. Great article – I really enjoyed this interview. GBS seems like he’s incredibly knowledgeable regarding MLS. We’re glad to read your take on this interview, Dave. Thank you.